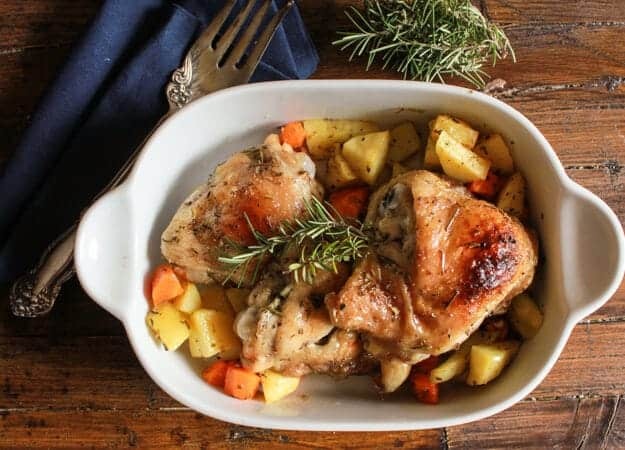 Italian Herb Roasted Chicken, the perfect family Dinner Recipe. 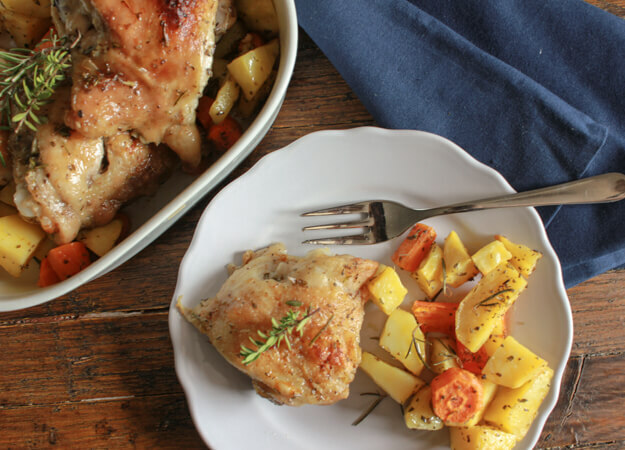 Roasted Chicken with Potatoes and Carrots makes this a favourite for everybody. One of my favourite holidays has almost arrived, Thanksgiving. I love stuffed turkey and my goodness, nothing beats pumpkin pie. It has been years since I had stuffed turkey and it looks like this year will be passing by without a turkey for me. I have two reasons for this, one just in the last few years I have noticed turkey in the grocery stores, but only at Christmas time, and two my husband does not like turkey. How can someone not like Stuffed Turkey? So obviously I can’t buy a turkey for 2 or 3 people, so I make the best of it and make instead Italian Herb Roasted Chicken. Not Turkey but pretty darn good. I think it is that great combination of herbs and the basting that makes this Herb Roasted Chicken so delicious. And 5 or 10 minutes under the broiler get this chicken nice and crispy on the outside and still moist on the inside. One of my favourite Roasted Vegetables is now carrots, and they are a terrific combination with potatoes. Toss them with some of the herbs and olive oil and let them bake to perfection. 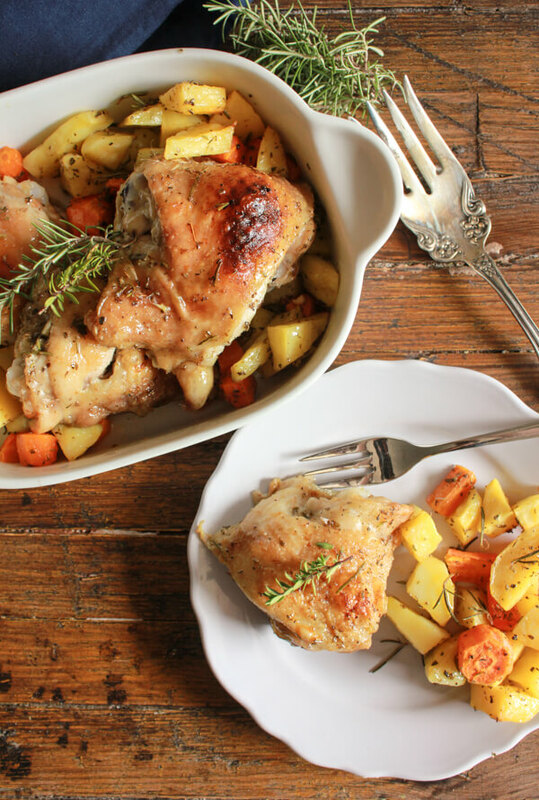 An easy, tasty Italian Herb Roasted Chicken recipe is ready for dinner. Buon Appetito! 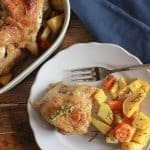 Italian Herb Roasted Chicken and Potatoes, this easy oven roasted chicken and vegetable recipe, is healthy, delicious, crispy and moist. In a small bowl mix together olive oil,chopped rosemary and thyme, sage, oregano, salt and minced garlic, remove 2-3 teaspoons for the potatoes and carrots. 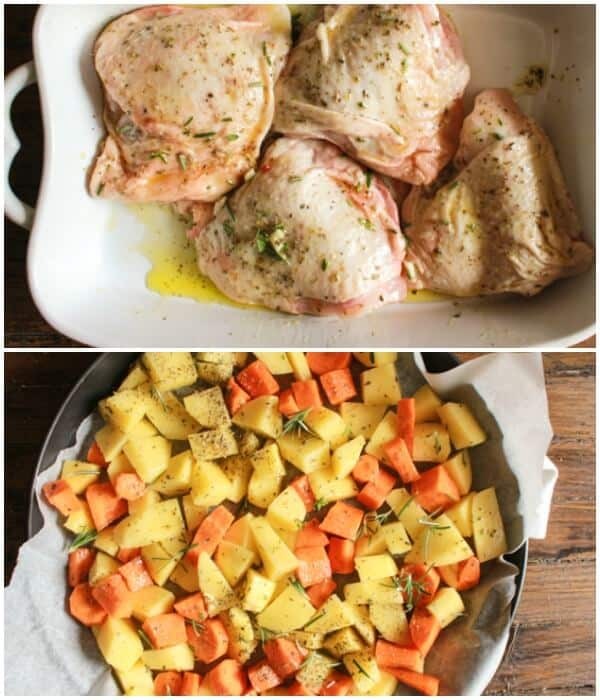 Toss the potatoes and carrots with the 2-3 teaspoons of herb mixture , place in parchment paper lined baking dish (I drizzled with a little extra olive oil, oregano and salt). Bake in oven 50-60 minutes. Cover the chicken pieces really well with the small bowl of herb mixture, top and bottom, place in second non stick baking dish, single layer. Bake for approximately 40 minutes or meat is no longer pink. Baste meat with drippings 3-4 times during baking. Turn on broiler and broil for approximately 3-5 minutes until browned. Serve immediately. Enjoy! Lovely. I love this kind of simple yet hearty dish. Hi Jack, thanks so much, I love hearty dishes. Have a great weekend. Made it! Everyone loved it. ? Hi Diana, so glad to hear it. Have a great long weekend. Thanks April, cozy meals are the best. Have a great weekend.